Silver Knights Updates and memories. Plus some generally cool pictures and memories. honorary Knight by proxy. Also, he's British. 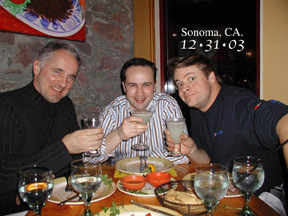 Here they are in Sonoma, California on New Years Eve of 2003.
and the oldened bodies that have betrayed them. It was in September of 1998, in front of roughly 5 thousand people. Luckily he survived and they now have a beautiful 2 year old son. 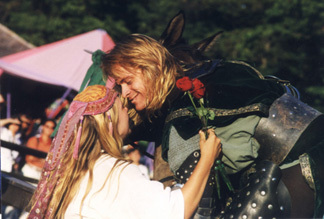 They were married a year later on the same joust field they got engaged on. art director for Charles Schultz Creative Associates in Santa Rosa, California. The way we were, 1997. 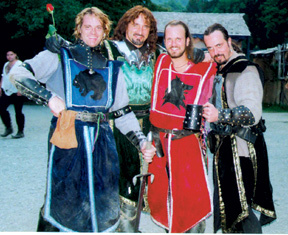 From left to right, Justin, Michael, Alen, and Chris. More to come, keep checkin' in.